Zydeco’s is definitely one of my favorite restaurants in Indy. I mean it’s only fifteen to twenty minutes from 465 to the door -address is technically Mooresville. I still say Indy. I laughed. 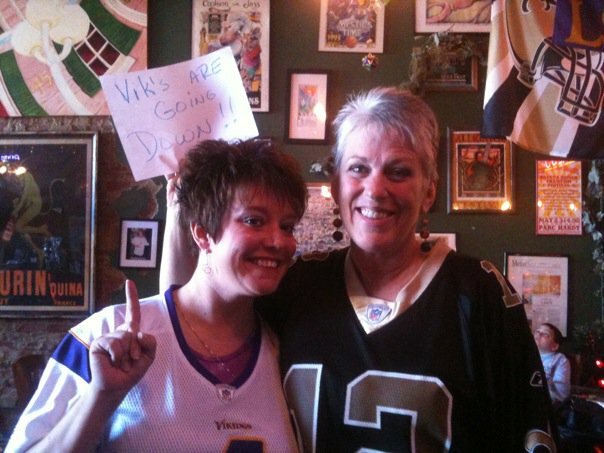 Deb is a huge Saints fan, and I’m a huge Favre/Vikings fan. I was devastated last year when the Vikings lost to the Saints in the NFC Championship game, but was happy for their big fan Deb. The highly anticipated rematch is Thursday night, so of course she’s going to give me a hard time. I had a cute outfit planned for my brunch adventure, but thought, maybe I should check to see if Deb is wearing her jersey. I called the restaurant and Deb answered the phone, all I had to say was, are you wearing your jersey? She said no, I didn’t see your reply on Facebook, are you wearing your? Of course, I replied. She said OK, I’m going to run home and change, I laughed – of course she is. I said see you soon, and hung up. Zydeco’s on the first Sunday of the month has a Sunday Brunch. I’ve been for dinner several times, but not brunch. That was going to all change today. We loaded up the car and headed south with Cajun on our mind. When we got to the restaurant there was a Jazz Band playing, which just added to the New Orleans style atmosphere that Zydeco’s has. I was greeted by Deb in her Saints jersey with a hug. At Zydeco’s you’re part of the family. She had her camera ready to a photo op. So I stood there with my friend getting our picture taken, what I didn’t notice is the sign that Deb stuck behind my head. The Brunch menu changes from time to time because everything at Zydeco’s is fresh. The dinner menu changes monthly because everything is fresh. Today’s Sunday Brunch menu includes a drink, appetizer, entree, and desert for $24.95. Choices of drinks include a Hurricane, a smooth fruity drink made with rum, a glass of House Wine, a Mimosa (champagne and orange juice), or a Bloody Mary. You can also have Soda (Pepsi products) Coffee, Tea, or Juice. 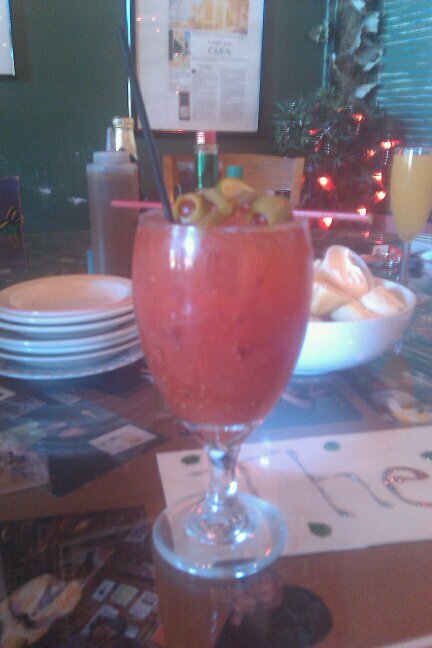 I opted for the Bloody Mary, which had just the right amount of heat, with olives and spicy green beans as a garnish (Which Karen – one of the staff- makes herself). Mr. D had a Mimosa and my Mom had a glass of wine. Sam and Kam stuck with the hard stuff, soda and water. Appetizers included Jambalaya, Veggie Creole, Gumbo, Bistro Salad or Half & Half (half Jambalaya, half Gumbo. I had the Half & Half, which was warm with New Orleans goodness. The chicken was tender and the sausage melted in your mouth. This little bowl of heaven was accompanied by warm bread to make sure you didn’t leave any of the goodness behind. As I was wiping away the last bit of my Half & Half my entree arrived. Entrees today included Steak Chimi (flat iron marinated in a smoky & spicy Chimi sauce) with rosemary roasted potatoes and dirty rice. Spicy Shrimp and Cheese Gritts. Veggie Creole. YaYa Chicken with Rice and Jambalaya. Crawfish Creole mumbled eggs. Chicken and Andouille Gunbo. Jolie Blond Pasta. 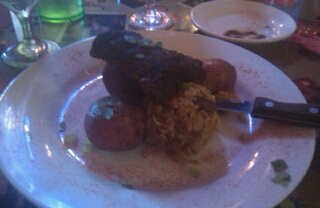 Cochon and Potato Salad. Mr D. and I choose the Steak Chimi, my Mom had the Shrimp and Cheese Gritts, Sam had the YaYa Chicken and Kam (Mr Excitement) had the Chicken Fingers and Fries. The Steak Chimi, which had just been added to the menu, proved not to be a disappointment. Deb suggested I try it, and I always go with what she suggests. The steak was smokey and tender, cooked perfectly to order. The dirty rice was flavorful and seasoned delightfully. The potatoes were warm with a nice crisp on the outside and mashable on the inside. I tasted my Mom’s Shrimp and Cheese Gritts which were very creamy, and loaded with shrimp. My Mom’s only comment was “the only thing wrong with this dish is that there isn’t any more of it”. Sam’s YaYa Chicken was tasty. The chicken breast was huge (very moist and juicy) the sides of rice and jambalaya overflowed on the plate. Finished, looking at each other like, how could I possibly eat one more bite of anything, our waiter came and said, so what’s for dessert? I gave my fresh strawberries with whipped cream to Kameron, which he devoured. 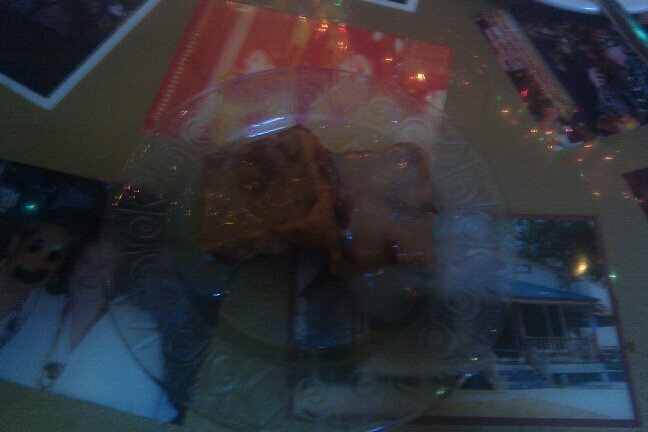 Mr D and my Mom had the Bread Pudding with Rum Sauce. I’m not going to lie, I’m not a fan of Bread Pudding. My Mom coaxed me into trying a bite of hers. I was warm and the rum sauce made it fabulously gooey. If she hadn’t taken it away from me, I would have ate the whole thing. While we were finishing up Deb came out and talked to us for a bit. She is one of the many things that gives Zydeco’s its New Orleans charm. Laughing until our bellies hurt we decided to pack up and head home. Deb walked us to the door and bid us farewell, encouraging me to cheer on the Saints Thursday – as if. If you have not been to Zydeco’s I would make it a point to make the drive for the best Cajun/New Orleans style food in Indy. You won’t be disappointed. Wednesday 5-9 pm, Thursday 5-9 pm, Friday 5-10 pm, Saturday 5-10 pm. Jazz Champagne Brunch “First” Sunday of every month from 11-2 pm.